Are you a community campaigner or club or society leader? Then register now to take part in Road Safety Week! 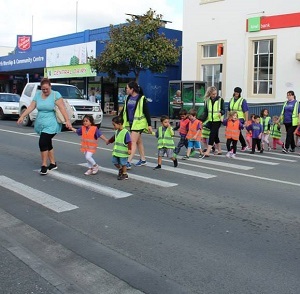 Road safety is a community issue. 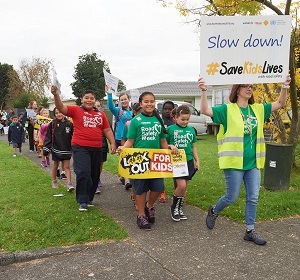 Dangers such as fast drivers and a lack of safe crossing places for pedestrians blight communities across New Zealand and cause deaths and injuries. Road Safety Week is the ideal opportunity for you to get local people together to put an end to road deaths and injuries in your region by running your own activities and campaigns, and it's easy to take part. To get your online bulletin of tips, ideas and downloadable resources to use, register today! You can also join other community groups signing up to run a road safety fundraiser for Brake during the Week. If you can't run an event but you want to help Brake, please support us by making a secure online donation. Organise a media photo call at a local school, kindy, uni, workplace or club. Find out from your local council the number of people killed and injured on your region's roads last year. Arrange for that number of people to lie down in the shape of that number somewhere safe (e.g. a school playground) or for that number of people to stand holding placards saying 'Road Safety Week' and 'End Carnage' and 'X killed and injured', or for that number of empty shoes to be displayed, representing lost lives, or for a balloon release in memory of lives lost.... the ideas are endless and you will have a good one. Identify a road that you know has problems, for example the traffic speed is scaring local residents or there has been a death or injury. Arrange a media photo call to happen near but safely away from that road (e.g. behind school railings). Arrange a media spokesperson who can give interviews about the importance of safe communities and driving slowly and very carefully. Children, with the permission of their parents, make great media spokespeople. Talk in advance to local officials such as the police or local road safety officers, so they know what you are doing and you can ask them for any necessary safety advice, and so they can give you any information they have about plans underway to make the road safer. Take a look at our community campaign kit, containing information and advice on how to set up a community group, hold demos and awareness-raising events, get in the media and organise successful petitions. Have a look at the Brake shop, which has low-cost items like balloons to help decorate your display. Send emails to people in your community about Road Safety Week. Keep your messages simple. If offering road safety advice, stick to the basic life-saving messages. Pass on the rules of the Brake Pledge. For our mascot Zak the Zebra's advice for young children and parents, click here. Hold a fundraiser for Brake. 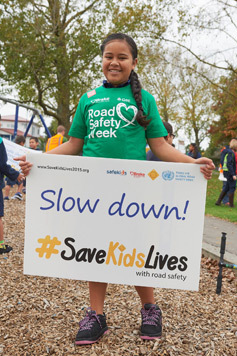 Whether you have a sausage sizzle, a car wash day, a rugby friendly or get sponsored to climb a mountain, do it in Road Safety Week for Brake, to help us develop and deliver our services in New Zealand, educating people about road safety and supporting families affected by road death and injury. Why not have a Bright Day and get everyone to dress up in crazy bright clothing for a gold coin donation to raise awareness of the vulnerability of people on foot and bikes? Or join in with our Virtual Run. Or fundraise for Brake in another way - find ideas here. Don't forget to register and tell us what you're planning so we can feature your activities!